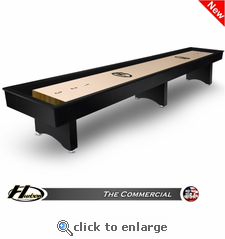 Introducing the Commercial Shuffleboard only from Hudson Shuffleboards! Built for Commercial use in either a home or bar setting, the Commercial Shuffleboard Table features a universal design that is sure to be the focal point in any setting! This high quality game table features a 3” thick playing surface constructed of select kiln-dried Hard Rock Maple and topped with a Polymer Finish (lifetime warranty). This is the same finish insisted upon by the Professionals in tournament play. And to help keep the playing surface true, climatic adjusters are included. The cradle and legs are constructed of solid wood and available in custom finishes (at no additional cost). You can even customize the playing surface with a custom logo. Also Included is One Set of Playing Weights, 2 Bottles of Speed Powder, Adjustable Leg Levelers, and One Board Wipe. Join the Pros and enjoy playing shuffleboard on a newly designed Commercial Shuffleboard by Hudson Shuffleboards. Available sizes are 9, 12', 14', 16', 18', 20', or 22' (tournament size). •Solid 3" Thick Select Kiln-Dried Hard Rock Maple Playfield with our Polymer Finish (Lifetime Warranty). •Cradle Bed is Gray Carpet. •9' Model has 2 Legs. •12'-16' Models have 3 Legs. •18'-22' Models have 5 Legs. •One Set of Playing Weights. •Two Bottles of Speed Powder. •5 Inch Adjustable Leg Levelers. • Cradle Height (top rail only): 8"